Not to be confused with AT&T Stadium in the Dallas–Fort Worth metroplex; AT&T Center in San Antonio; AT&T Field in Chattanooga, TN; or Jones AT&T Stadium in Lubbock, TX. AT&T Park is a baseball park located in the South Beach neighborhood of San Francisco, California. Since 2000, it has served as the home of the San Francisco Giants, the city's Major League Baseball (MLB) franchise. Originally named Pacific Bell Park, then SBC Park in 2003 after SBC Communications acquired Pacific Bell, the stadium was ultimately christened AT&T Park in 2006 following SBC's buyout of AT&T. The park stands along the San Francisco Bay, a segment of which is named McCovey Cove in honor of former Giants player Willie McCovey. AT&T Park has also played host to both professional and collegiate American football games. The stadium was the home of the Foster Farms Bowl, an annual college postseason bowl game, from its inaugural playing in 2002 until 2013 and also served as the temporary home for the University of California's football team in 2011. Professionally, AT&T Park was the home of the San Francisco Demons of the XFL and the California Redwoods of the United Football League. The stadium can be reached via San Francisco's Muni Metro; the 2nd and King Station is directly outside the ballpark. Originally designed to be a 42,000-seat stadium, there were slight modifications before the final design was complete. When the ballpark was brought to the ballot box in the fall of 1996 for voter approval, the stadium was 15° clockwise from its current position. Also the center-field scoreboard was atop the right-field wall and the Giants Pavilion Building were two separate buildings. Groundbreaking on the ballpark began on December 11, 1997, in the industrial waterfront area of San Francisco known as China Basin in the up-and-coming neighborhoods of South Beach and Mission Bay. The stadium cost $357 million to build and supplanted the Giants' former home, Candlestick Park, a multi-use stadium in southeastern San Francisco. A team of engineers from UC Davis was consulted in the design process of the park resulting in wind levels that are approximately half those at Candlestick. Fans had shivered through 40 seasons at "The 'Stick" and looked forward to warmer temperatures at the new ballpark. But because AT&T Park, like its predecessor, is built right on San Francisco Bay, cold summer fog and winter jackets in July are still not unusual at Giants games, despite the higher average temperature. When it opened on March 31, 2000, the ballpark was the first Major League ballpark built without public funds since the completion of Dodger Stadium in 1962. However, the Giants did receive a $10 million tax abatement from the city and $80 million for upgrades to the local infrastructure (including a connection to the Muni Metro). The Giants have a 66-year lease on the 12.5-acre (51,000 m2) ballpark site, paying $1.2 million in rent annually to the San Francisco Port Commission. The park opened with a seating capacity of 40,800, but this has increased over time as seats have been added. In April 2010, the stadium became the first MLB ballpark to receive LEED Silver Certification for Existing Buildings, Operations and Maintenance. 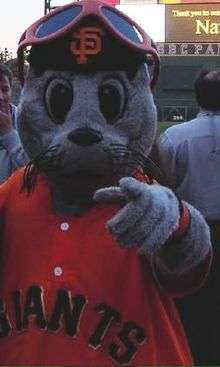 The opening series took place April 11–13, 2000 against the Los Angeles Dodgers (the team the Giants faced in their final series at Candlestick Park), and the Giants were swept in three games. In the first game of that series, the Giants lost 6–5, highlighted by three home runs from the Dodgers' Kevin Elster. On May 1, 2000, Barry Bonds became the first player to hit a "splash hit" home run into McCovey Cove. In just its first few years of existence, the ballpark saw its share of historic events primarily due to veteran Giants outfielder Barry Bonds. On April 17, 2001, Bonds hit his 500th career home run at then-Pacific Bell Park. Later that year, he set the single season home run record when he hit home runs number 71, 72, and 73 over the weekend of October 5 to close the season. On August 9, 2002, Bonds hit his 600th career home run at the park. On April 12, 2004, Bonds hit career home run 660 at SBC Park to tie Willie Mays for third on the all-time list and on the next night, he hit number 661 to move into sole possession of third place. On September 17, 2004, Bonds hit his 700th career home run at the park to become just the third member of baseball's 700 club. On May 28, 2006, Bonds hit his 715th home run at the park to pass Babe Ruth for second place on the all-time list. On August 7, 2007, Bonds hit his 756th home run, breaking Hank Aaron's record. The park hosted games three through five of the 2002 World Series against the Anaheim Angels, which the Giants lost four games to three. It also hosted the 2007 MLB All-Star Game, which the American League won 5–4 over the National League. On July 10, 2009, the Giants' Jonathan Sánchez pitched the first no-hitter at AT&T Park. Also, the stadium hosted an AMA Supercross Championship round from 2003 to 2010. On October 27 & 28, 2010, the Giants hosted the first two games of the World Series, beating the Texas Rangers in both games. They ultimately went on to win the series, their first championship since the team moved to San Francisco in 1958, though the clinching game was played at Rangers Ballpark in Arlington rather than at AT&T Park. On June 13, 2012, Matt Cain threw the 22nd perfect game in MLB history — and first in Giants history — against the Houston Astros. AT&T Park hosted Games 1 and 2 of the 2012 World Series on October 24 and 25. The Giants beat the Detroit Tigers twice, 8–3 and 2–0 respectively. The Giants would go on to win the 2012 World Series in a four-game sweep at Comerica Park. The stadium hosted of the semifinal and final rounds of the 2013 World Baseball Classic on March 17–19. On July 23, 2013, due to a previous rain-out in Cincinnati, AT&T Park served as the "home" venue of the Cincinnati Reds for the second game of a doubleheader against the Giants. Giants manager Bruce Bochy won his 1,500th career game. On June 25, 2014 Tim Lincecum pitched the 3rd no hitter at AT&T Park against the San Diego Padres in a 4-0 win. It was his 2nd no hitter of his career, with both of them coming against the Padres. His first one was in San Diego on July 13, 2013. AT&T Park hosted Games 3, 4, and 5 of the 2014 World Series on October 24, 25, and 26. The Giants beat the Kansas City Royals 2 out of the 3 games played at AT&T Park, losing Game 3, 3–2, before winning Games 4 and 5, 11–4 and 5–0 respectively. They ultimately went on to win the series in seven games, with the clinching game played at Kauffman Stadium rather than at AT&T Park. On June 15, 2015 the Giants set a record for most consecutive home losses at AT&T Park at nine straight games with a 5-1 loss to the Seattle Mariners. This losing streak was the Giants' longest since an 11-game home loss streak at the Polo Grounds in New York in 1940. Barry Bonds passes Harmon Killebrew for seventh on the all-time home run list on May 13, 2002. Note the sign on the scoreboard saying "Pacific Bell Park". The Pacific Telephone & Telegraph Company, a local telephone company in the San Francisco Bay Area, purchased the naming rights for the park for $50 million over 24 years in the Winter of 1996. Pacific Bell had been recently purchased by SBC Communications when the naming rights deal was agreed upon. 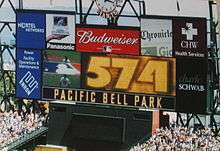 SBC eventually dropped the Pacific Bell name and reached an agreement with the Giants to change the stadium's name to "SBC Park" on January 1, 2004. After SBC bought AT&T Corporation on November 18, 2005, the name of the merged company became AT&T Inc. As a result, the stadium was given its third name in six years: "AT&T Park". A few fans still refer to the stadium as "Pac Bell Park", as it was the first name given to the stadium. Others have named the stadium "The Phone Booth" or "Telephone Park", for the constant name changes, while some referred to the stadium as "Some Big Corporation Park" due to the SBC years. Others yet refer to it as "Mays Field" in honor of Giants great Willie Mays or simply "The Bell". Many also refer to the stadium as "China Basin" or "McCovey Cove" after its location, which would be immune to changes in sponsorship naming. Giants Enterprises, a wholly owned subsidiary of the San Francisco Giants created and headed by longtime team executive Pat Gallagher, brings non-baseball events to AT&T Park on days when the Giants do not play. Prominent among these has been the usage of the stadium for football. For example, the park was home to the XFL's San Francisco Demons in 2001, was the home of the East-West Shrine Game (until 2006), and was the former home stadium of the California Redwoods of the UFL in 2009. From 2002 to 2013, it has also been home to college football's Fight Hunger Bowl, previously the San Francisco Bowl and most recently the Emerald Bowl. In 2011, AT&T Park became the temporary home football stadium for the California Golden Bears while Cal's on-campus stadium, California Memorial Stadium, underwent renovation. AT&T Park also hosted its first high school football game in 2011, the Central Coast Section Division III football championship game between long-time San Francisco rivals St. Ignatius College Preparatory and Sacred Heart Cathedral Preparatory. AT&T Park has also hosted a range of other sporting and musical events. On February 10, 2006, the U.S. men's soccer team defeated Japan 3–2 at AT&T in a friendly. A match of the 2011 World Football Challenge between Manchester City and Club America was held at AT&T, drawing a crowd of 11,250. The Mavericks big-wave surfing contest is broadcast live on the giant video display at AT&T Park when the event is held. In 2006, the park hosted ICER AIR the first stadium big-air ski and snowboard competition to be held in the United States. A virtual recreation of the park was created as a gig venue for Guitar Hero World Tour. In summer 2010, the park hosted an audition stop for the 2011 (10th) season of American Idol. San Francisco Opera partnered with Giants Enterprises to do three broadcasts, most recently Tosca, in June and September 2009. In October 2013, rapper Kanye West rented out the stadium and the scoreboard for a private event, which turned out to be an elaborate marriage proposal to his girlfriend, reality personality Kim Kardashian. The stadium contains 68 luxury suites, 5,200 club seats on the club level and an additional 1,500 club seats at the field level behind home plate. On the facing of the upper deck along the left field line are the retired numbers of Bill Terry, Mel Ott, Carl Hubbell, Monte Irvin, Willie Mays, Juan Marichal, Orlando Cepeda, Jackie Robinson, Willie McCovey, and Gaylord Perry as well as the retired uniforms, denoted "NY", of Christy Mathewson and John McGraw who played or managed in the pre-number era. These two pre-number era retired uniforms are among only six such retired uniforms in all of the Major Leagues. AT&T Park has a reputation of being a pitcher's park and the most pitcher-friendly ballpark in the National League due to the depth of the outfield limiting home runs, according to ESPN. In 2014, PETA declared the park to be the Most Vegetarian-Friendly MLB ballpark in the country. It held the top spot on the same list in 2011, 2006 and 2005. The most prominent feature of the ballpark is the right field wall, which is 24 feet (7.3 m) high in honor of former Giant Willie Mays, who wore number 24. Because of the proximity to the San Francisco Bay, the right field foul pole is only 309 feet (94 m) from home plate. The wall is made of brick, with fenced off archways opening to the Cove beyond, above which are several rows of arcade seating. The fence angles quickly away from home plate; right-center field extends out to 421 feet (128 m) from home plate. Atop the fence are four pillars with fountains atop. These four pillars will burst jets of water when the Giants hit a home run, win a game, and at the end of the National Anthem. In the past, rubber chickens put up by fans whenever a Giants player (especially Barry Bonds) was intentionally walked, would line the foul portion of the wall. The fans would do this to show that the opposing team is "chicken" for not pitching right to the Giants players. In recent seasons, as the team's strength has shifted from hitting to pitching, fans will line up "K" signs with each strikeout by a Giants pitcher. To some seniors, the right field area vaguely suggests the layout at the Polo Grounds. This deep corner of the ballpark has been dubbed "Death Valley" and "Triples' Alley." Like its Polo Grounds counterpart, it is very difficult to hit a home run to this area, and a batted ball that finds its way into this corner often results in a triple. Triples' Alley is also infamous for bad bounces, most notably when Ichiro Suzuki hit the first-ever inside-the-park home run in an All-Star Game by lining the ball off one of the archways and sideways past the outfielders. Nate Schierholtz performed the same feat in the 2009 season as a pinch hitter. Aubrey Huff did it again in the 2010 season, as did Conor Gillaspie in 2011. Ángel Pagán ended a game in May 2013 with a two-run walk-off inside-the-park home run, the first of its kind at AT&T Park. Beyond right field is China Basin, a section of San Francisco Bay, which is dubbed McCovey Cove after famed Giants first baseman and left-handed slugger Willie McCovey, and into which a number of home runs have been hit on the fly. 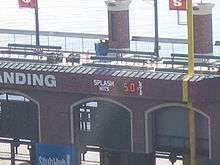 As of June 17 2016, 70 "splash hits" have been knocked into the Cove by Giants players since the park opened; 35 of those were by Barry Bonds, and the most recent being Denard Span hitting one off Chase Anderson of the Milwaukee Brewers on June 13, 2016. These hits are tallied on an electronic counter on the right field wall. Opponents have hit the water on the fly 42 times; Todd Hundley of the Los Angeles Dodgers was the first visitor to do so on June 30, 2000. Curtis Granderson of the New York Mets, Luis Gonzalez of the Arizona Diamondbacks and Cliff Floyd of the Chicago Cubs are the only visiting players to do so twice, while Carlos Delgado of the New York Mets has performed the feat three times. Adam LaRoche has also hit three splash hits, twice with the Arizona Diamondbacks and once with the Pittsburgh Pirates. Cody Asche of the Philadelphia Phillies most recently hit one into the water - part of a 2 home-run effort in a game the Giants still managed to win 8-4, in a game on July 12, 2015. On June 27, 2010, David Ortiz of the Boston Red Sox became the first American League player to hit a splash hit. The only other AL player who has done it is Mitch Moreland of the Texas Rangers. Barry Bonds is the Giant who has hit the most home runs into "The Cove" as Giants fans call it and is the only one to have had hit 2 splash hits in one game (a feat he accomplished twice). Behind the scoreboard in center field there is a pier where ferries can tie up and let off fans right at the park. On game days, fans take to the water of McCovey Cove in boats and even in kayaks, often with fishing nets in the hope of collecting a home run ball. (This echoes what used to happen during McCovey's playing days. Before Candlestick Park's upper deck was extended, the area behind right field was occupied by three small bleacher sections and a lot of open space. Kids in those bleachers would gather behind the right field fence when "Stretch" would come to the plate.) Just beyond the wall is a public waterfront promenade, where fans can watch three innings of a game through the wall's archways, free of charge, albeit with a somewhat obstructed view. Across the cove from the ballpark is McCovey Point and China Basin Park, featuring monuments to past Giants legends. When the park opened in 2000, taking residence on the right field wall was Rusty, the Mechanical Man based on a theme of Old Navy since the wall was sponsored by the company. Rusty was a two-dimensional robotic ballplayer that stood 14 feet (4.3 m) tall and weighed 5½ tons. The Valencia, California firm, Technifex, engineered, fabricated and programmed Rusty to appear after major plays, during games, as a fully animated giant 1920's era tin "toy". After technical problems arose with Rusty, it was removed from the Old Navy Splash Landing, though the enclosure that housed him remained for years. In 2006 the Old Navy sponsorship of the wall was terminated and renamed "Levi's Landing". In 2008, the enclosure was removed as that area near the right field foul pole was renovated for a new luxury party suite called the "McCovey Cove Loft". Behind the left field bleachers is "The Coca-Cola Fan Lot". 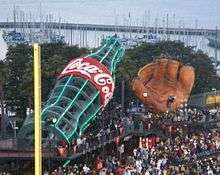 The ballpark features an 80-foot (24 m) long Coca-Cola bottle with playground slides that lights up with every Giants home run, and a miniature version of the stadium. "The Coca-Cola Superslide" is popular with children as is with adults, and the terraced levels of the slides are a fun way to catch the game. Bubbles originally accompanied the bottle, but never worked as intended and were removed. If one were viewing the outfield promenade from home plate, directly to the bottle's right is another oversized representation of a ballpark stalwart, the "Giant 1927 Old-Time Four-Fingered Baseball Glove" — this particular one is made of steel and fiberglass. Behind and farther to the left is "The Little Giants Park" – a miniature baseball diamond — sort of a minor league tryout for Pee-Wee Ball. To the right of the glove sculpture is the elevator and large plaza area for functions and parties to be held during games. It's also the site of "Orlando's", the concessions stand of Giants great Orlando Cepeda. The signature fare at the stand is the "Caribbean Cha Cha Bowl". Right-center field features a real San Francisco cable car (retired cable car #4, formerly #504), with a label that states "No Dodgers Fans Allowed". The fog horn — a feature introduced at Candlestick Park by the current Giants ownership group – was transferred to AT&T and hung underneath the scoreboard. It blows when a Giants player hits a home run or at the conclusion of a Giants win. Continuing right takes one to the promenade above the Cove, so that one can make a completely uninterrupted circuit of the park at that concourse level. Both levels of the concourse, inside the stadium, feature not only concession stands of all sorts, but other attractions as well. Located behind the centerfield bleachers, the ballpark features the @Café, a social media café, which opened in the 2013 season. The cafe serves Peet's Coffee and features large screens that show off fans' social media posts from Facebook, Twitter, and Instagram, which are curated by the Giants organization. The cafe replaced a team-themed Build-A-Bear Workshop store, where fans could build their own stuffed Giants' mascot, Lou Seal, or create other Giants-themed stuffed animals. In addition to the automated scoreboards, which now include a new high-definition video board by Mitsubishi, the park has enormous, manually operated boards on the right field wall, which display the scores of Major League games played elsewhere. These manual scoreboards are operated by three employees, whose work on game days starts at least two hours before the first pitch. Starting in 2004, the Giants installed 122 wireless internet access points, covering all concourses and seating areas, creating one of the largest public hotspots in the world at the time. On September 23, 2008, the Giants Wall of Fame was unveiled on the King Street side of the ballpark, as part of the 50th-anniversary celebration of the Giants' move to San Francisco. 43 retired players were inducted, based on longevity and achievement. Eligibility requirements for players to be on the Wall are either five years as a San Francisco Giant with an All-Star Game appearance or nine years as a Giant. Rich Aurilia and Shawn Estes were added in 2010. Jason Schmidt and Marvin Benard were added in 2011. Outside the ballpark are six statues, five of which are dedicated to San Francisco Giants all-time greats. The Willie Mays Statue is located in front of the ballpark entrance at 24 Willie Mays Plaza and is surrounded with 24 palm trees, in honor of his number 24 uniform, retired by the Giants. It was dedicated at noon on March 31, 2000, prior to the opening of the ballpark and was commissioned by Giants Managing Partner Peter Magowan and his wife Debby. Another statue is located at McCovey Point across McCovey Cove, and is dedicated to Willie McCovey. Around the Willie McCovey Statue are a number of plaques that celebrate the winners of the Willie Mac Award. The statue is located at China Basin Park next to The Barry Bonds Junior Giants Field, a T-ball park. Also located on the sea wall promenade are plaques showing the Opening Day roster of every Giants team from 1958 through 1999. Giants fans who contributed funds to China Basin Park, had their own tiles with their own inscriptions set into the wall. A third statue, dedicated in 2005, honors former Giants pitcher Juan Marichal, and is located outside the ballpark at the Lefty O'Doul Gate entrance. The fourth statue is located at the park's ferry plaza behind center field, also known as Seals Plaza; a statue of a seal bobbing a baseball on its nose honors the memory of the San Francisco Seals, the minor league baseball club that played before the arrival of the Giants in 1958. On September 6, 2008, during a series against the Pittsburgh Pirates, a fifth statue depicting former Giants great Orlando Cepeda was dedicated at the corner of 2nd and King Streets next to the ballpark. A sixth statue, dedicated on August 13, 2016, honors former Giants pitcher Gaylord Perry and is also located at the corner of 2nd and King Streets next to the ballpark. All five statues of the Giants Hall of Fame players were created by sculptor William Behrends of North Carolina. ↑ "The San Francisco Giants' AT&T Park". Major League Baseball Advanced Media. Retrieved September 17, 2007. ↑ Crumpacker, John (May 11, 2010). "Cal Football to Temp at AT&T Park". San Francisco Chronicle. Retrieved December 4, 2013. ↑ "AT&T Park". Populous. Retrieved June 9, 2014. ↑ "Team". Alliance Building Partners. Retrieved December 4, 2013. ↑ "AT&T Park". Thornton Tomasetti. Retrieved December 4, 2013. ↑ King, John (April 11, 2000). "Neighbor-Friendly Lighting At Stadium Earns a Halo". The San Francisco Chronicle. Retrieved May 8, 2012. ↑ "AT&T Park". Ballparks.com. Archived from the original on July 12, 2010. Retrieved December 4, 2013. ↑ Epstein, Edward (February 25, 1997). "The Giants' Grand Designs / Statue of Willie Mays to Grace New Ballpark". San Francisco Chronicle. Retrieved June 9, 2014. ↑ "Engineering: Taking the Wind Out of Baseball". UC Davis Magazine. Retrieved September 18, 2007. 1 2 "Privately Built Pacific Bell Park a Curse to Other Teams". Lawrence Journal-World. Associated Press. October 22, 2002. Archived from the original on September 30, 2007. Retrieved September 18, 2007. ↑ Gordon, Jon (May 14, 2004). "In San Francisco, the Giants Went Private for Their Stadium". Minnesota Public Radio. Retrieved September 17, 2007. ↑ "AT&T Park Becomes the First Major League Ballpark to Receive LEED Silver Certification for Existing Buildings, Operations and Maintenance" (Press release). Major League Baseball Advanced Media. April 21, 2010. Retrieved August 14, 2013. ↑ Sheldon, Mark (July 16, 2013). "Cincinnati Reds Set to Call San Francisco Home for Game 1 of Doubleheader". Major League Baseball Advanced Media. Retrieved December 4, 2013. 1 2 3 Raine, George (February 4, 2006). "It's Official: SBC Park Becomes AT&T March 1 / S.F. Giants Will Be Playing Ball on Field's Second Name Change Since Opening in 2000". San Francisco Chronicle. Retrieved August 13, 2012. ↑ "Baseball Gets Wired In San Francisco". Forbes. 10 April 2000. Retrieved 15 October 2014. ↑ "Cal Football to Play 2011 Home Season at San Francisco's AT&T Park" (Press release). University of California, Berkeley Athletics. May 10, 2010. Retrieved January 24, 2011. ↑ Stephens, Mitch (November 30, 2011). "CCS Division III Title Game Set for AT&T Park". San Francisco Chronicle. Retrieved December 4, 2011. This will be the first high school football game played at AT&T (the two schools have played baseball games there as part of the Bruce-Mahoney series). ↑ Garchik, Leah (October 22, 2013). "Kanye's S.F. Proposal to Kim Kardashian". San Francisco Chronicle. Retrieved May 24, 2014. ↑ "2013 MLB Park Factors". ESPN. Retrieved June 9, 2014. ↑ "AT&T Park Ranked Most Vegetarian-Friendly Ballpark by PETA," KCRA, 14 July 2014. ↑ "Splash Hits". Major League Baseball Advanced Media. Retrieved September 18, 2007. ↑ "AT&T Ballpark Attractions". Major League Baseball Advanced Media. Retrieved December 4, 2013. ↑ Elder, Jeff (June 18, 2013). "Welcome to AT&T Park's New Social Media Cafe – Home of the Giant Tweetdeck". San Francisco Chronicle. Retrieved June 9, 2014. ↑ "Giants Wi-Fi Network". Major League Baseball Advanced Media. Retrieved December 4, 2013. ↑ Haft, Chris (September 23, 2008). "Giants Honor Greats with Wall of Fame". Major League Baseball Advanced Media. Retrieved June 9, 2014. ↑ "Wall of Fame". San Francisco Giants official website. MLB Advanced Media, L.P. Retrieved April 8, 2012. ↑ Haft, Chris (September 22, 2008). "Giants to Unveil 'Wall of Fame'". Major League Baseball Advanced Media. Retrieved June 9, 2014. ↑ Haft, Chris (July 24, 2010). "Aurilia, Estes to Join Giants Wall of Fame". Major League Baseball Advanced Media. Retrieved December 4, 2013. ↑ "San Francisco Giants Attendance". Baseball-Reference. Retrieved August 13, 2012. ↑ Epstein, Edward (August 7, 1998). "'All Choked Up / Giants Legend Willie Mays Is Moved By Statue of Him for New Ballpark'". San Francisco Chronicle. Retrieved December 4, 2013. ↑ "San Francisco Giants McCovey Point And China Basin Park". Major League Baseball Advanced Media. Retrieved December 4, 2013.